The LaserTag Paintball system is lightweight, compact and suitable for even the youngest of players. 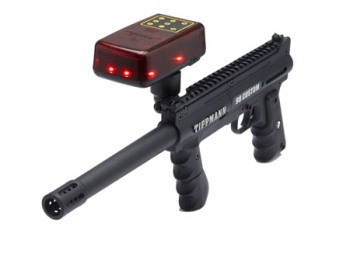 We have taken the popular Tippmann 98 Custom marker and converted it to a permanent infrared transmitter and receiver. This new system removes the need for C02 to operate while still using a real paintball marker just like the big guys. This is the perfect system for young players looking to be introduced to the sport of paintball and laser tag. Just like going to the LaserTag arena, the system uses RF transmitters to transmit and recieve information to each gun, and to the Command Center. The Command Center connects to a laptop computer to control the games, and also keep track of scores. Great for kids birthday parties, but ADULTS love it too! * Please call us for any questions on our paintball lasertag system 6 gun rentals in New Orleans, Metairie, Kenner LA and surrounding NOLA metro area.